'Pewee' (E. Bruce Williamson, R. 1933) MTB (IB), 20" (51 cm), Honorable Mention 1958; Williamson-White Award 1968. Note: Originally registered as IB. From Longfield Iris Farms catalog, 1934: Pewee (Wmsn. No. 917, 1934). (Pedigree Lost). A tiny pure white flower on gracefully well-branched stems 17 inches high. A perfect little gem. $0.75. 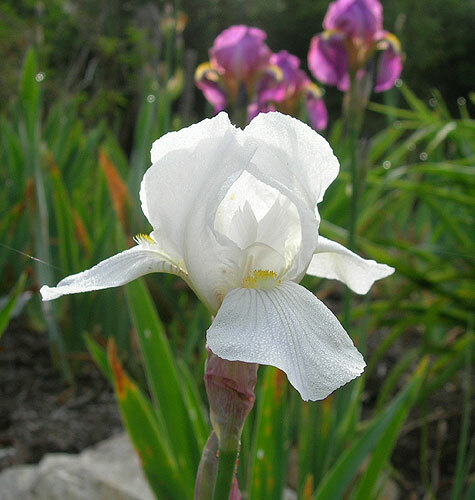 From Milliken Iris Gardens catalog, 1940: PEWEE (Williamson) Another of the new group of "table irises" and a perfect gem of a tiny pure white Rower on graceful well-branched stems. 17 inches high. 2Sc; 3 for 50c. JPG pewee1.JPG manage 422 K 19 Jul 2018 - 01:48 Main.TLaurin Photo by Nancy McDonald-The Pickle Barrel Collection. JPG pewee2.JPG manage 403 K 19 Jul 2018 - 01:50 Main.TLaurin Photo by Nancy McDonald-The Pickle Barrel Collection. JPG pewee3.JPG manage 447 K 19 Jul 2018 - 01:51 Main.TLaurin Photo by Nancy McDonald-The Pickle Barrel Collection. JPG pewee4.JPG manage 438 K 19 Jul 2018 - 01:52 Main.TLaurin Photo by Nancy McDonald-The Pickle Barrel Collection. JPG pewee5.JPG manage 386 K 19 Jul 2018 - 01:54 Main.TLaurin Photo by Nancy McDonald-The Pickle Barrel Collection.